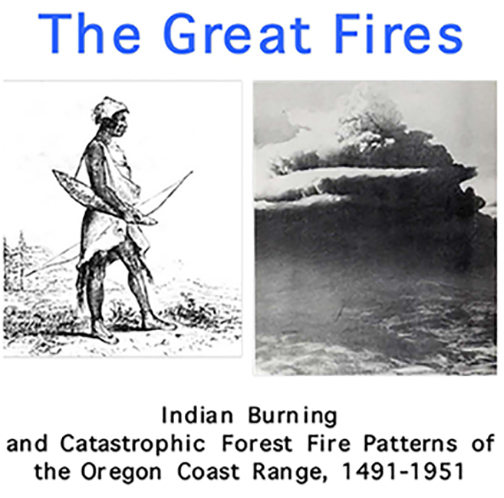 The Great Fires is the definitive consideration and documentation of landscape-scale Oregon Coast Range fire history for the past 500 years. This book is a reprinting of Dr. Zybach's 2003 Oregon State University PhD dissertation and includes all text, 60 maps (47 in color), 38 figures (17 in color), and 26 tables (1 in color) contained in the original. Some minor typos have been corrected, but numbered pages have been reduced from 451 to 364 by removing academic signature sheets and by reformatting text and tables with changed fonts and spacing. The principal result has been a change in pagination, so academic citations will vary between the two versions. Hardcover book is printed with premium quality color ink on high-grade 70# paper. Dimensions are 8 1/2" by 11" with 368 total pages. $85.00.